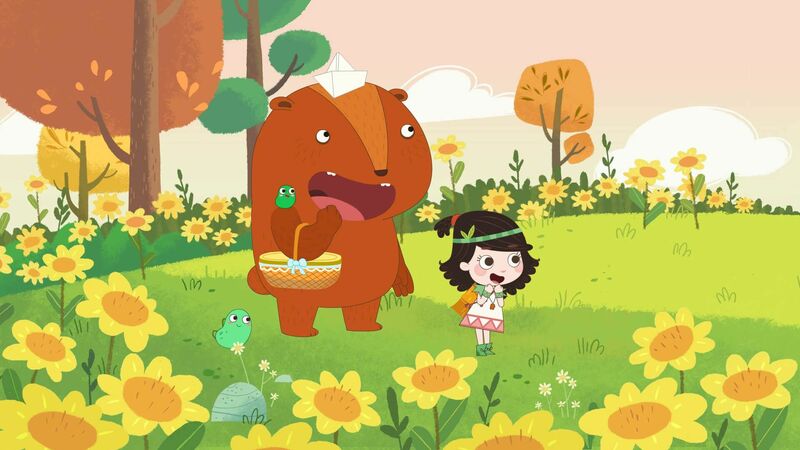 French distributor Superights announced today a new partnership with CJ E&M South Korea for 3 preschool series of its catalogue: Emmy & Gooroo, Helen’s Little School and Bo Bear. The series will be launched this year on the new Pay TV Channel of the group English Gem focusing on English learning. Produced by Left Pocket and Tomavision the adventures of Emmy & Gooroo (52×11’) have already been acquired by YLE in Finland, Paka Paka in Argentina, Studio 100 in MENA. Helen’s Little School (52×11’) produced by Superprod and Muse Entertainment has been launched last fall on France Television’s France 5 (France), Télé-Québec, TFO, Knowledge Network (Canada), Minimax (Poland) and Discovery’s youth channel DKids (Latin America). This is also a significant deal for Bo Bear (26×5’), the first live action series of Superights, as it marks its first international sales ahead of other ongoing discussions around the globe. “We are excited to have such beautiful programmes from Superights on our lineup of the new kids channel, English Gem.” commented Diana Kim, General Manager of Premium TV Contents at CJ E&M. “I am thrilled of this first collaboration with CJ E&M, no doubt it will be a great home for our little heroes” says Safaa Benazzouz, Sales Manager for Asia at Superights. Superights is an international sales company dedicated to Kids and Family programs. Its catalogue includes PUFFIN ROCK (52×11′) produced by ‘Cartoon Saloon’ and ‘Dog Ears’ and globally acquired by Netflix all over the world, PAT THE DOG produced by ‘Superprod’ and ‘Animoka’ and sold in over 180 countries including Disney USA, Turner EMEA & APAC and Discovery Kids Latin America and BOYSTER (52×11′) produced by ‘Je Suis Bien Content’ sold among others to Disney USA, EMEA, Latin America, Japan & South East Asia as well as Animax in Korea, HELEN’S LITTLE SCHOOL (52×11′) produced by ‘Superprod’ and ‘Muse Entertainment’ and EMMY & GOOROO (52×11′) produced by ‘Left Pocket’ and ‘Tomavision’. Recent additions to the catalogue are THE HORN QUARTET (1×26’), produced by ‘Vivement Lundi’, BO BEAR (26×5’), Superights’ first live action series produced by Spark and CLAY TIME (30×3’) produced by REAZ. CJ E&M is at the forefront of the latest cultural trends as Asia’s top media contents company. CJ E&M Media Business provides various programmes through 18 channels available across diverse platforms and the new channel “english gem” is a premium pay channel for pre-schoolers in Korea. It aims at providing the opportunity to learn the English language in a more natural way through internationally renowned quality programs for children. The channel will be launched in May 2018.